tone controls? yes - or no ? hey, that was fun, let's answer another question that comes up almost everyday. Do you want tone controls? I don't know, you tell me! Do I recommend tone controls? NO! Do I use tone controls? YES! Confusing? YES! OK, so if you think you want tone controls, the answer is yes, you probably do want tone controls. I perfectly understand that not everyone has perfect ears, perfect speakers, perfect room setup. I understand there is probably more poorly recorded music, than music that is recorded perfectly!! So what you need to know is that tone controls will always compromise sound quality. This is because using a circuit with tone controls means you need to have a minimum of 3X as much gain as you do without them. A high quality tone control circuit needs 20db of gain to overcome the losses of tone controls. by using negative feedback to reduce gain on those tones. worse signal to noise ratio, more distortion, and usually all the other frequencies (the critical midrange) are subjected to negative feedback. These are the things we deal with in order to make the music sound better to our own ears, using our own speakers, our own rooms, our own recordings. We do need tone controls to overcome all these short comings, but we have to accept that the compromises involved are not as bad as the results. Are they better? They can be, or maybe not, that again, is a subjective question that only you can answer for yourself. Oh, so maybe you'd like my OPINION, rather than the facts as presented above? my own listening room, my own recordings, some of which are awful, some have no bass, some have way too much bass, some are tinny, some are hollow. then you don't need a bass control on your preamp!!! You don't need extra gain, extra noise, poorer circuit design. What a concept!!! So . . . . need more treble? Gee, let's think about that for a moment. Maybe I could add an extra tweeter, a more efficient tweeter, one with it's own gain control. . . .
Hey, here's an idea for you. Make sure your listening room is at least somewhat enhanced to actually sound better. Do some research, read some books, buy some room treatments. Go all in !!! Buy a digital DSP EQ system for $10,000 and have it shape and perfect everything to your ears and your room! Really??? No, I think NOT!!! The bottom line - music is for enjoyment, and that is subjective, so do your own thing!!! either buy an SP14 (and a PH16 for phono) or buy an SP9 with tone controls, and then . . . . enjoy the music!! Simple!! Re: tone controls? yes - or no ? it's seldom an issue of permanently adding bass or treble, it's an issue that some recording lacks ( or has too much) of something. It's not me room or my equiplment, it's my habit of enjoying records even if the recording engeneer smoked funny stuff or just had a bad day. Even then i would like the music to be "as good as possible". The discussion however might lead to something positive, a preamp might be like pas-4, with no built-in tonecontrols but with a loop for a tonecontrol that could be engaged at will. This would open up a market for "tonecontrol-units" that adds less "bad-sound" then eq-boxes. I use dynamic expansion. low bass synthesis, holographic imaging, hardware peq, speaker compensation, impulse correlation, rephasing, software convolution, R128 loudness, etc ... but I don't use tone controls. Not sure if that's a yes or a no, but it's a definite maybe ... yeah ... definite! No tone controls for me. Mine goes source-> preamp -> amp -> speakers. I got great speakers and room treatments. All I need. Well, that and great music. I gave them up many years ago. My solid state preamp has defeatable tone controls and I haven't engaged them for years. My tube preamp doesn't have any. Except for the rare instance of playing a bad or old recording (which has yet to come up), I feel like I'd only need them if I didn't do my job correctly at some other point in the process - bad choice of gear, bad setup, bad acoustics. I try to avoid listening to any bad recordings, except for possibly early jazz guitar, which I play (badly!). So don't want the comprises that go with tone controls. OTOH, I do like a remote balance control for fine tuning imaging from my listening position. I'd like to see a remote option on the VTA preamps....the only thing they're lacking, IMO. Just a "teensy" bit with my Parasound Halo for the Paradigm Studio 10V5's for the low end versus connecting a sub.............for now! ST-70 is the amp. I definitely want tone controls. I use them very sparingly, but I always like to have the option if I want it. I suppose my ear isn't as well defined as some "audiophiles" who look at tone controls as some kind of mortal sin. On my own pre-amp, I can't hear any difference with the tone switch defeated or activated (with the tone controls flat). Some say even having the defeatable switch puts an unnecessary step in the audio circuitry that will lesson the audio quality, but I don't care. I need the freedom to adjust the tone during those few occasions when I just need more bass or a bit brighter sound. tone controls are removed from my pas3 . i like the clean sound of no tone controls . Many years ago I was of the "no tone control" camp. But I finally realized that a lot of records and CDs that I listened to sounded like cr@p. I belonged to that school of "listen to it as the producer/engineer INTENDED it." But I came to the conclusion that some of them apparently couldn't hear very well! So now I use tone controls regularly. I have records/CDs that I need to cut the bass, some that I need to cut the treble, and some that the controls stay flat. But not having the ability to make an adjustment is just not workable for me any more. I once equalized my system for my seating position to obtain flat response to ensure (in my view) that I got EXACTLY whatever the recording engineer "intended." It was the worst sound I have ever heard and it would send me running from the room. Of course, that's a totally ridiculous concept because sound doesn't work that way. A violin from a foot away doesn't sound the same 30 feet away. Basically, a flat response at the listening position meant a hugely boosted high end. If it sounds bad then it's bad. IMO tone controls can make listening to many sources pleasant instead of Unpleasant. Bob Carver (at the time Audio Control) made a sweet little 5-band powered EQ back in the 1980s you could take completely off-line. Later versions of the Model 520 had a switchable and very unobtrusive rumble filter as well. Pots were rotary, not slide, and frequency adjustments were a very handy 35, 50, 120 Hz, and at 1kHz and 15.5 kHz. Had a tape/mon front-panel switch as well if that's how you wanted to set it up. I used one for many years to perk up my Dahlquist DQ-20i speakers and still use one with my sand amp/Dynaco A-35 set-up. I have a spare and if somebody would like to "borrow" it for a month or two for the price of postage both directions - it's neither very heavy nor very large, you're welcome to it. Or you can find one now and then on AudioGon or Fleabay in the $50-$90 range. A cheap way to test the waters. PM if interested. Well, I took Dave's advice and actually bought the one one he referenced on eBay. 1. I drank a six pack and turned it up too loud. 2. My room is actually too small to be cranking this thing on singles mixes. 3. I didn't need to get into the world of room treatments. Minor problem solved for $67. Thanks Dave! And thanks to the forum for all of the great info. AND thanks for the great VTA gear!! Slightly off topic but since you were suggesting using your preamps as a compliment to 'our' sound systems I have a multi-part question regarding other 'preamps' as well as yours. And I'm not an electronics guy and I don't understand what different types circuits do or why one is better than the other so my questions may be off base. A while ago another forum member, if I remember correctly, posted something about about how you built a preamp for him using a Glassware Tube Buffer for him rather than your own preamp designs. The reason I recognized that was because a friend built a Tube Buffer using the same exact board for me. So can you tell us what the differences between your preamps and the tube buffer and how they improve or alter the sound? And for that matter what do the differences between the preamps you sell do? And what is it that makes one board a preamp and another one a tube buffer? I have other questions but I do have leave for work. Thanks in advance. I just got back from a 3 week vacation, so sorry for the delayed reply. Seems you are asking me about tube preamps, what's the difference between a preamp and a buffer, etc. higher odd order harmonics which seems to "enhance" the sound quality. A preamp does all this but also has GAIN, usually around 12db or 4X gain of the original signal. What do I do different than Glassware? #1 is I use a tube power supply, as this makes a noticeable improvement in the sound quality. otherwise you would get pops and glitches during turn-on/turn-off, requiring a circuit usually using a relay to ground the signal for 20-30 seconds. Count me in for Tone controls. Equalizer too. Due to normal human hearing when I play music at a low volume, I like the effect of not only Tone controls, but also ahem, the Loudness button on rare occasions to boost the lower frequencies. Maybe it's my taste in music but there are many recordings I would have mixed and EQ'd differently. For me a good part of HiFi is the ability to tailor the sound to my liking. The room furnishings are pretty well set and the room layout dictated when they are placed so I'm limited as far as room treatments go. After getting a 5.1 receiver in 2000 (Sony STR-DA777ES) I said goodbye to tone control as this does not have them. When I upgraded to a Emotiva UMC-200 (Sony used as a power amp) the "Tone controls" are 11 parametric EQ settings for each channel so a simple bass or treble boost is not possible. 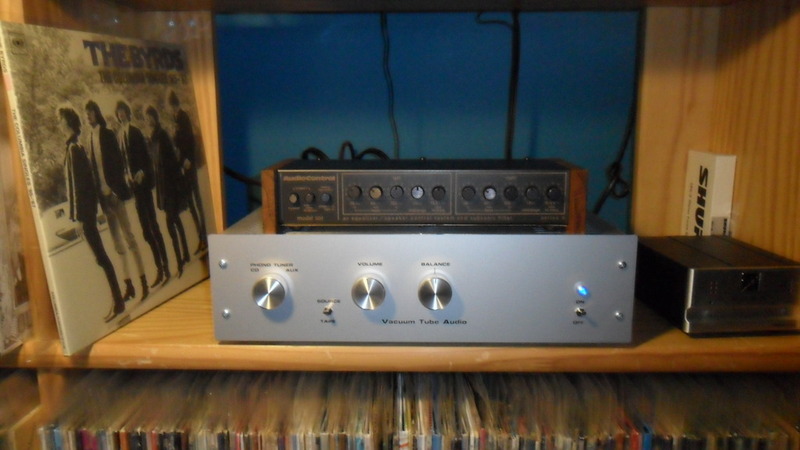 So with a Crown IC-150 preamplifier I have Bass/Treble + Loudness available with my Tube system. All this said I do find I rarely need to boost any frequencies. The ST-120 has so much bottom end I sometimes find myself reducing the bass via preamp Tone control. (This is easier than adjusting the sub volume on each speaker.) I just like to have Tone controls as an option for the times I feel the need. jimmeq wrote: Count me in for Tone controls. Equalizer too. Due to normal human hearing when I play music at a low volume, I like the effect of not only Tone controls, but also ahem, the Loudness button on rare occasions to boost the lower frequencies. Maybe it's my taste in music but there are many recordings I would have mixed and EQ'd differently. For me a good part of HiFi is the ability to tailor the sound to my liking. The room furnishings are pretty well set and the room layout dictated when they are placed so I'm limited as far as room treatments go. Your tubes are your tone controls. It's nice to tweak but you can do that with speaker placements and wall treatments as well, while keeping the signal path clean. I am a firm believer in tone controls. When correctly and properly applied, such as the Baxandall tone control circuits, they allow the user/listener to fine tune a given song or recording to suit their ears, compensating for speaker placement, room layout and condition and the original recording, of which not all are done well. It is all very well saying change your speaker placement or treat your room, but I'd guess that this is just not possible or practical in most situations except for those purpose designed listening rooms. Tone controls have gotten a bad rap over the years, mostly due to misinformation, be it 'innocent' or willing, as well as just plain not understanding the electronics and functions of a given circuit. Yes, there are some badly designed tone controls out there which does not help. Again I stress, when correctly designed and implemented, tone controls can indeed be an asset! erhard-audio wrote: I am a firm believer in tone controls. When correctly and properly applied, such as the Baxandall tone control circuits, they allow the user/listener to fine tune a given song or recording to suit their ears, compensating for speaker placement, room layout and condition and the original recording, of which not all are done well. All of my front-line pre-amps have defeatable tone controls, being the Revox A720, Dynaco PAT 4, 5, & PAS 3x, and Citation 17. The PAT 5 has an EPL (also defeatable) for the insertion of an equalizer if wished. The AR Integrated amp and receiver tone controls null in the center position, as with the Dynaco SCA80. So, there is no "loss" in having them, meaning that on those few times they are really needed, they are there. We all have our personal bits of audiophoolery, some of them 'popular' and some not so much. As long as we have a sense of humor about it, it is all fine. But my bit is that I believe that proper speakers properly fed and properly placed will overcome the most difficult rooms without additional treatment. By way of explaining "proper" speakers, a tiny little 2-way speaker in a very large room is kinda-sorta not the way to go, and putting Maggies in a closet, not so much either. But, were I to design my own pre-amp (not gonna happen, guys and gals, but....) it would have tone controls. yes, an important point I missed to mention. And this goes back to using a well designed tone control circuit, such as the Baxandall. With the tone controls centered/cut, the control is 'out of the circuit'. Still, some prefer to believe a lot of the bull that is floating around this industry, not just about tone controls, but about a lot of other misinformation and urban myths! Well, I demur slightly on tone controls. The Audio Control box Dave in Va has is a case in point, and you can switch it completely out of the signal path. I had a pair of DQ-10s one time which were a bit wimpy on the low end and the Audio Control nicely fixed the curve. I am a bit of a purist. During my years as a rock critic, I eschewed the backstage hangout and located the mixer out in the cattle section, and that's where I sat -- I wanted to hear what he was hearing. So I've been of the "straight pipes" persuasion. But given the shortcomings of the medium and the vagaries of room acoustics, a little signal tweak can be in order. deepee99 wrote: Well, I demur slightly on tone controls. The Audio Control box Dave in Va has is a case in point, and you can switch it completely out of the signal path. I had a pair of DQ-10s one time which were a bit wimpy on the low end and the Audio Control nicely fixed the curve. IMHO, the correct way to use tone controls is 'as needed!' The years I spent in recording studios taught me that very valuable lesson! But it is always good to have them on 'standby'. "As needed" is a good philosophy. Probably more than most on this forum, my collection of recordings include a substantial number of "historic" provenance, from a time when recording techniques were not as accurate as they can be now. As for records made more recently, note the "can be," as too often recording engineers and producers intentionally introduce inaccuracy because it suits their taste (or their monitoring loudspeakers, faults and all). Whatever the drawbacks of tone controls, when they can be used to "fix" an imperfect recording, the results are better than the plain, unaltered sound. I have no objection to reasonably designed and defeatable tone controls. Used in moderation they are fine, if needed. I am of the school that you should endeavour to create a system that sounds good, make that excellent, without tone controls. I am OK with hearing performances as recorded, I don't feel the need to tweak on a song-by-song basis. But if you have done so, and there is some issue that can be dealt with by the judicious use of a tone knob or switch, by all means take advantage. There is no glory in being dis-satisfied with your own system built on purist minimalist controls in the signal path. Be happy. I'm of the same mind when it comes to DSP. Not a fan, but I'm not everybody, and if you are, I still think you should start with a good sounding well balanced system to begin with, and then make your digital equalization corrections. I'm reminded of a certain off-colour joke that refers to certain birth control devices with "ribs", designed to "please her". The punch line? " I turn them inside out and please myself." » tone controls? yes - or no ?